World's fairs date from the 1790s. The American Institute Fair, held annually in New York City from 1829 to 1897, is sometimes considered the first world's fair held in the United States. The American Institute was founded in 1829 "for the encouragement of agriculture, commerce, manufactures, and the arts," the underlying theme of most fairs. The first world's fair held in the United States that was not an annual event was the Exhibition of the Industry of All Nations, which opened in what is now Bryant Park in New York City in 1853 and was modeled after the 1851 London exhibition, including a replica of London's "Crystal Palace." Two of the more famous world's fairs held in the United States were the Centennial Exposition held in Philadelphia in 1876 and the World's Columbian Exposition, which opened in Chicago in 1893. New York State hosted the Pan American Exposition in Buffalo (1901) and two more world's fairs in New York City (1939-1940 and 1964-1965). Robert Moses was the president of the 1939 and 1964 fairs. Both were held in Flushing Meadows-Corona Park, and both had two seasons, each running from spring to early fall. The first season of the 1939 fair ran from April 20, 1939, to October 31, 1939, and the second season ran from May 11, 1940, to October 27, 1940. The first season of the 1964 fair ran from April 22, 1964, to October 18, 1964, and the second season ran from April 21, 1965, to October 17, 1965. Both fairs were financial disasters due to overestimated projections of attendance and mismanagement of funding. The 1939 New York World's Fair emphasized advancements in technology that were becoming more and more readily available in society and the theme of the fair was "Building the World of Tomorrow." "Futurama," the exhibit offered by General Motors, had an observation deck from which spectators could look down at a futuristic New York City. The fair was divided into zones: Transportation Zone, Government Zone, Communications and Business Systems Zone, and Food Zone. The second New York World's Fair is most remembered for its Unisphere, an engineering marvel which promoted the fair's theme: "Peace through Understanding." Compared to the 1939 fair, the 1964 fair placed a higher emphasis on branding and commercialism. While most of the companies that exhibited at the 1964 fair are still in business, some of them have been bought out by other companies or have ceased to exist: General Cigar (Scandinavian Tobacco Company as of 2010), General Foods (defunct in 1990), Sinclair Oil (acquired by ARCO in 1969), Texaco (merged with Shell/Chevron), U.S. Royal Tire (merged with Goodrich in 1987 and Michelin in 1990), and Westinghouse (defunct in 1999 after a merger with Viacom). Much of the content in this collection is in the form of ephemera – booklets/brochures, pamphlets, flyers, etc. that advertised the fairs – and most of the collection (22 boxes) is related to the 1939-1940 and 1964-1965 fairs that were held in New York City. Series 1 consists of photographic depictions of the exhibits in the New York State Pavilion in the 1939 World's Fair. The photographs are grouped by regions in New York. Each region occupied a space in the New York Pavilion with photographs of regionally-specific activities paired with physical objects that are culturally significant to the area. Photographs in the miscellaneous category are of non-region-specific exhibits. Folders 47 through 49 contain question marks after the titles "Amphitheater" because these photographs are untitled and it's just conjecture that the photographs depict different angles of the amphitheater. Series 2 and 3 contain administrative documents, promotional materials and financial reports leading up to the opening of the 1939 and 1964 New York world's fairs, respectively. 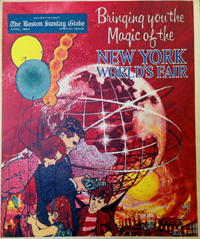 Series 2 also contains brochures, ticket stubs, newspaper articles, etc., related to the 1939 New York World's Fair. 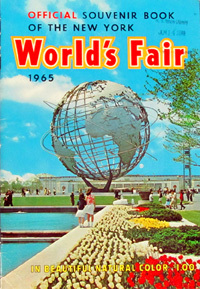 Series 3 focuses on the 1964-1965 World's Fair. Box 6 contains brochures from pavilions representing about 10 states in the United States; Box 7 contains brochures from pavilions representing about 20 countries or regions of the world. Boxes 8 through the first half of 11 contain information on corporate exhibits. The second half of Box 11 through Box 13 contains magazines with feature articles about the World's Fair. Series 4 contains oversized ephemera, including posters and newspaper articles, from the Chicago Columbian Exposition of 1893, the Paris Exposition (Exposition Universelle) of 1900, the St. Louis Universal Exposition of 1904, the 1939 New York World's Fair, and the 1962 Seattle World's Fair, and posters from the 1964 New York World's Fair. Folders 1-9 in Series 5 contain pamphlets, booklets, a visitor's guide and postcard collections from the Chicago Columbian Exposition of 1893. Folder 10 contains maps, pamphlets of various companies, and newspaper clippings of the 1933 fair. Guidebooks and catalogs from the International Exhibition of Arts, Manufactures and Products of the Soil and Mine, more commonly known as the Philadelphia Centennial Exposition (May 10 to November 10, 1876), celebrating of the hundredth anniversary of the signing of the Declaration of Independence. Brochures, souvenir booklets, tickets and catalogs from the Pan-American Exposition (Buffalo, May 1 to November 2, 1901), famous because President William McKinley was assassinated at the expo. Souvenir booklets from the Louisiana Purchase Exposition (St. Louis, Missouri, April 30 to December 1, 1904), more commonly known as the St. Louis Exposition. Brochures, illustrated programs and booklets from the Hudson-Fulton Celebration (New York and New Jersey, September 25 to October 9, 1909). Guidebooks from the Panama-California Exposition (San Diego, California, January 1, 1915 to January 1, 1917), which celebrated the completion of the Panama Canal. A postcard depicting the Zoro Garden from the California Pacific International Exposition (San Diego, May 29 to November 11, 1935, and February 12 to September 9, 1936). A brochure from the Department of Corrections from the 1958 New York State Fair, which is held annually in Syracuse, New York. Booklets, brochures, postcards and souvenir maps from Expo 67 (Montreal, Canada, April 27 to October 29, 1967). 4 4 "Governor Lehman Lays Corner Stone for New York State Building at World's Fair September 24, 1938"
Series 2 contains brochures, ticket stubs, newspaper articles, etc., related to the 1939 New York World's Fair. Dancing Waters pictorial magazine, n.d.
L.I. Guide August 1964 "Places to Go, Things to Do"
New York World's Fair Guide-Presented by Altos Hornos de Vizcaya, S.A.
17 5 Booklet: "The Fair for Students"
17 7 Booklet: "The Fair for Young Children"
"I've Seen New York State at the Fair"
Transportation and Travel Pavilion Inc.
Series 6 contains ephemera from other exhibitions and expositions held between 1876 and 1980. The most interesting items in this collection are the souvenir booklets commemorating the exhibitions/expositions. Also included are visitors' guides, brochures and postcards.